Luther Price is an American experimental filmmaker who specializes in shooting short films on Super 8 film. 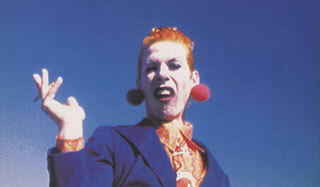 His films are frequently of a disturbing nature and feature himself as bizarre characters, such as clowns and drag queens. He currently teaches film at the Massachusetts College of Art and Design. Luther Price directs himself as a freakish, drooling, snorting clown in this cold, desolate little short film shot beautifully in Super 8.